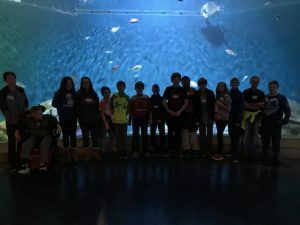 The 6th grade class took a field trip to the Mississippi River Museum and Aquarium in October as part of their unit on Freshwater Systems and Wetlands. The students did research on a wetland organism and created a mural. Many of them were able to see a live example of what they researched as well as numerous concepts learned in class. Thanks to Northeast Iowa Charitable Foundation and Silos & Smokestacks for funding this amazing trip! Check out the video here.